Houston hosted this year’s annual conference of the ACM Special Interest Group on Management of Data (SIGMOD). During the five-day event (June 10-15), several awards were presented to a select group of participants. 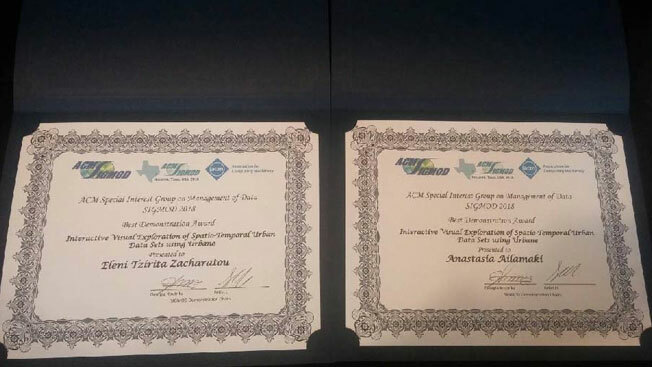 One of the most coveted of these awards is the Best Demonstration Award, won this year by Professor Anastasia Ailamaki and her student Eleni Tzirita Zacharatou, as well as their collaborators from New York University, Harish Doraiswamy, Fabio Miranda, Marcos Lage, Claudio Silva and Juliana Freire. Prof. Ailamaki is Lab Director and Ms Tzirita Zacharatou is pursuing her doctoral program in computer and communication sciences and bothare attached to EPFL’s Data-Intensive Applications and Systems Laboratory. The demonstration proposals received by the organizers went through rigorous and highly competitive selection criteria, leaving only one winner at the end of a six-month process: the EPFL duo’s presentation on “Interactive Visual Exploration of Spatio-Temporal Urban Data Sets using Urbane.” It was selected for showcasing an exciting and novel data management technology, backed by the extraordinary research and development efforts of the presenters. Elucidating their work in the paper, the researchers highlight the burgeoning number of datasets emerging in urban environments and from sensor applications associated with human interactions. That presents new opportunities for data-driven approaches to understand and improve cities. Visual analytics systems like Urbane help domain experts explore multiple datasets in different spatial and temporal resolutions. The main challenge in using systems like Urbane is to attain interactivity. Conventional approaches are not effective in supporting ad-hoc query constraints or polygons of arbitrary shapes. To tackle this constraint, the researchers propose the Raster Join approach, which converts a spatial aggregation query into a set of drawing operations on a canvas and leverages the rendering pipeline of the graphics hardware (GPU). In the process, Raster Join analyzes queries on the fly at interactive speeds on laptops and desktops. In their prize-winning demonstration, they integrated Raster Join with Urbane to enable interactivity. The members of SIGMOD include software developers, academic and industrial researchers, practitioners, users, and students. Over the years, the SIGMOD/PODS conference has become one of the most significant and selective events in the domain of data-driven management systems and technologies.